Another trio of good looking Ferrari watches released by Hublot this year. Even though the new Hublot Classic Fusion Ferrari GT was our real favorite this year at Baselworld 2019, the new Hublot Big Bang Scuderia Ferrari 90th Anniversary is not bad looking either. Available in platinum, 3D Carbon or Sapphire, this new watch celebrates the 90th anniversary of the Scuderia Ferrari racing team. Equipped with unique looking straps in either Nomex, Kevlar or Calf, all straps feature grey contrast stitching. For those of you not familiar with Nomex, this is a variant of aramid materials like Kevlar. While not as sturdy as Kevlar, Nomex has excellent thermal, chemical, and radiation resistance for a polymer material. Available in 3D Carbon ref. 402.QD.0123.NR, Sapphire Crystal ref. 402.JQ.0123.NR and in Platinum ref. 402.TQ.0129.VR, each watch is available in a limited edition of only 90 pieces. Unequivocally, the new Hublot Big Bang Scuderia Ferrari 90th Anniversary draws inspiration straight from the world of Ferrari in a flawless execution that is very automotive and ultra sporty. All three watches are fitted with carbon ceramic brake disc bezels, with either a red or yellow stripe that runs through the case, pushers and crown, and with a Ferrari engraving on the middle of the left caseband. While the 3D Carbon model is fitted with a black rubber and Nomex straps with dark grey stitching and a black ceramic and black-plated titanium deployant clasp, the Sapphire Crystal model sports a black rubber and Kevlar pattern fabric with light grey stitching and titanium deployant clasp and lastly the platinum model features a black rubber and perforated calf leather strap with light grey stitching and a black ceramic and titanium deployant clasp. 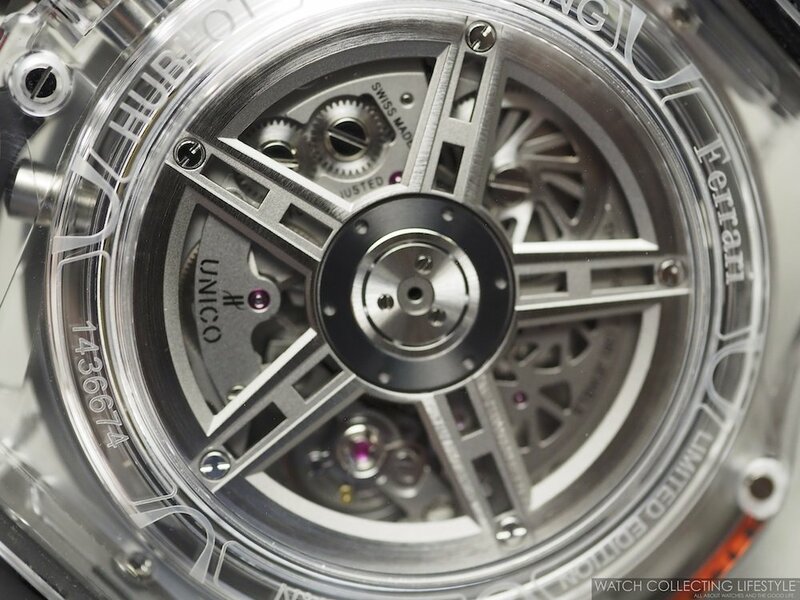 The case measures 45 mm in diameter and maintains the same design of previous iterations of the Big Bang Ferrari. Fitted with a sapphire crystal dial, the platinum model features highly contrasting yellow numerals and hands, a 60-minute chronograph with date aperture at 3 o’clock and running seconds indicator with a five-spoke wheel at 9 o’clock. The sword-shaped hands and numerals are in black on the sapphire crystal model and in red for the 3D carbon one. A Ferrari prancing horse on bas-relief is applied at the 6 o’clock position. These three new watches are powered by the Hublot HUB 1241 Unico in-house automatic movement with flyback chronograph and column-wheel mechanism. Composed of no less than 330 parts, 38 jewels and beating at a frequency of 28,800 vph, the movement provides an incredible power reserve of three full days when fully wound. Visible via the display case back, the five spoke oscillating weight makes things look even more automotive. The sapphire crystal display case back features a ‘90 Years Ferrari’ logo imprint. On the wrist, the watch wears true to its actual size and very sporty. While all three models are really nice, our favorite is the platinum one followed by the 3D Carbon. 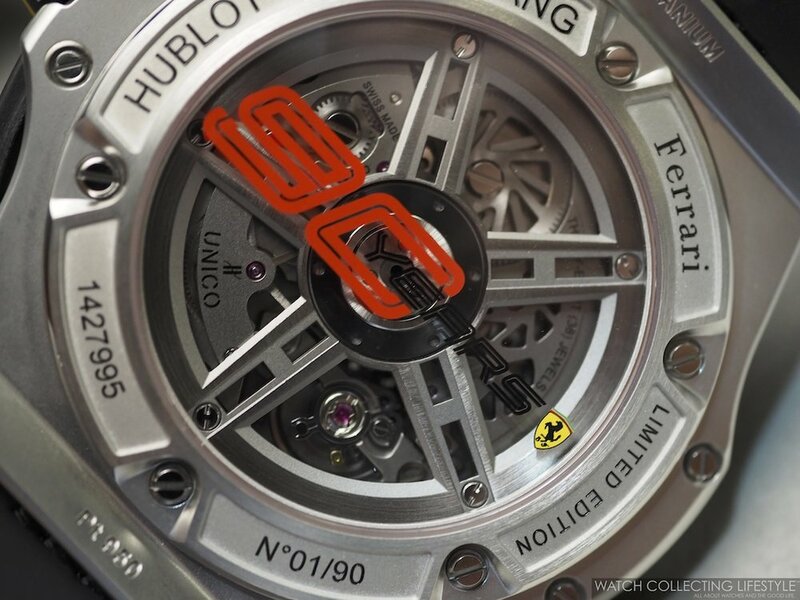 Yet another set of great looking watches with excellent design from the partnership between Hublot and Ferrari. Sticker Price $40,900 USD for platinum, $34,600 USD for 3D Carbon and $69,000 USD for sapphire. 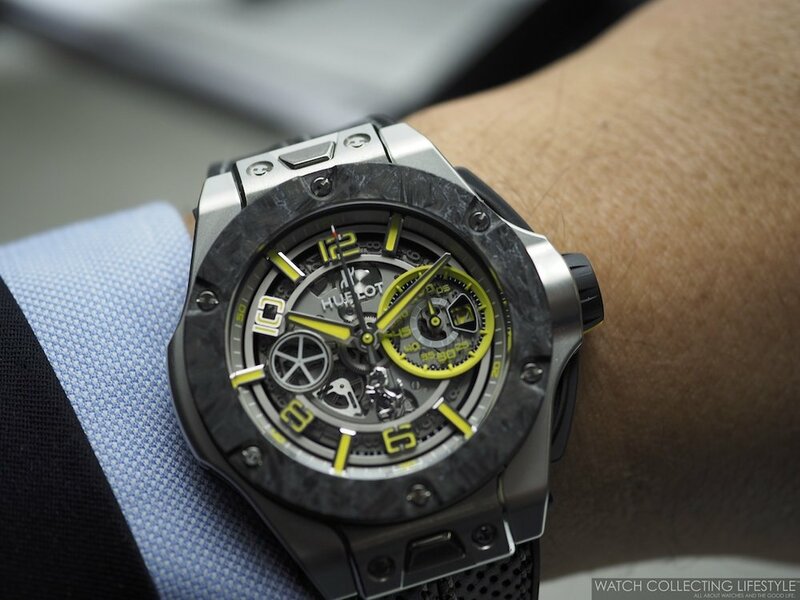 For more info on Hublot click here. Posted on April 1, 2019 by Editor & Publisher and filed under Hublot and tagged Hublot Hublotista Chronographs Ferrari Mainstream Brands 2019 Most Popular Hublot Big Bang Scuderia Ferrari 90th Anniversary.